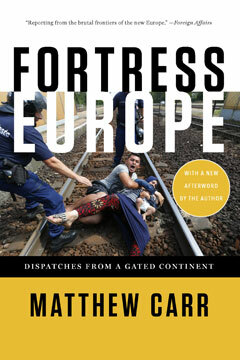 Singled out by Foreign Affairs for its reporting on “the brutal frontiers of new Europe,” Fortress Europe is the story of how the world’s most affluent region—and history’s greatest experiment with globalization—has become an immigration war zone, where tens of thousands have died in a humanitarian crisis that has galvanized the world’s attention. Journalist Matthew Carr brings to life remarkable human dramas, based on extensive interviews and firsthand reporting from the hot zones of Europe’s immigration battles, in a narrative that moves from the desperate immigrant camps at the mouth of the Channel Tunnel in Calais, France, to the chaotic Mediterranean Sea, where African migrants have drowned by the thousands. Speaking with key European policy makers, police, soldiers on the front lines, immigrant rights activists, and an astonishing range of migrants themselves, Carr offers a lucid account both of the broad issues at stake in the crisis and of its exorbitant human costs. The paperback edition includes a new afterword by the author, which offers an assessment of the current crisis and a searing critique of Europe’s response to the new waves of refugees.